Frankie | Bulldog in San Francisco. Frankie is such a character and a lover! 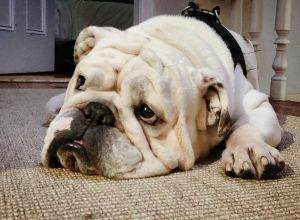 He is a classic bulldog and can be quite stubborn but just wants to spend his time exploring the neighborhood or relaxing with people. Hey, looking for someone to spend some time with Frankie while I’m at work as he loves to be around people! Frankie is the life of the party. Frankie is a great dog. He loves to be pet and feels confortable around humans. He’s a Bulldog so he can be a little slow sometimes and he likes to smell stuff on the way so don’t expect to go on a run with him but he’ll be fine for a walk to Alamo square. Had a lot of fun with him!